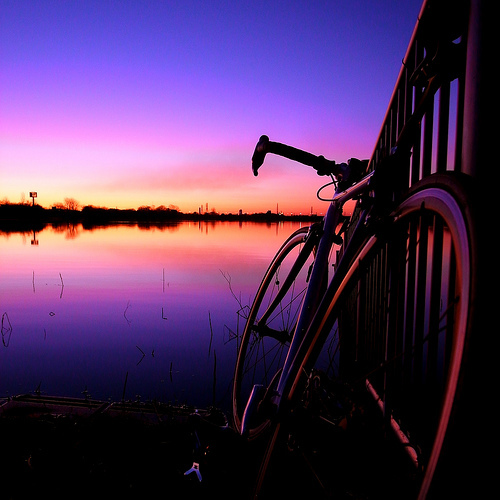 biking to the world-杜风彦的单车环球之旅: 11 things you'll love about bike touring. 11 things you'll love about bike touring. It may be a cliché, but there’s nothing quite like bike touring to get in touch with nature. How often do you drag yourself out of bed to marvel at the sunrise? When was the last time you stopped to gaze at snow-capped mountains or waves crashing in on a deserted beach? Bike touring liberates you to experience a daily dose of natural beauty. No tossing and turning and fitful rest for someone who’s been cranking the pedals for six hours straight. After a hard ride, flopping down on an inflatable mattress is as comfortable as sliding between fresh white sheets at the Hilton. Bike touring is a great way to get yourself out of a rut and get in shape at the same time. Socializing with a constant stream of new people exposes you to fresh ideas and challenges you re-think the way you live. Need I say more. Get out of the cubicle, hop on your bike and breathe! Yes, suffering really does build character. A vision of Eric and I slogging our way through a sea of sand near Lake Turkana always pops into my mind when I’m faced with a difficult situation. It’s the new benchmark for suffering and reminds that, with the right attitude, any situation can be mastered. When you’re bike touring you don't normally know where you’ll sleep, what you’ll eat or who you’ll run into on the road ahead. What you do discover is I that you’ll always find food, shelter and friendly folks along the way. Biking helps you deal with the vagaries of life and builds confidence in dealing with any set of circumstances thrown your way. We all agree that bike touring is not a race. But sometimes you’ve just got to find out what you’re made of. 200+ kilometers in one long haul fells pretty darn good from time to time. With thousands of empty hours spent hunching over your handlebars, you’ve got plenty of time to contemplate life.The steady turn of the wheels induces an almost meditative state that helps you focus on what really counts in life. Having escaped from the office, there’s no need to put on a professional face and feign interest in sales quotas and company gossip. Bike touring liberates you to ‘be real’ full time. A half gallon of chocolate-chip ice cream for an afternoon snack? Why not. A spontaneous race to the top of the hill with a group of exotic-looking Masai on bikes making their way to the local market. A cup of tea with a Berber family in their mud-walled hut high in Morocco’s Atlas mountains. That’s the stuff adventure is made of. How do I master reset my Edge 800? copyright biking2.com. Awesome Inc. theme. Powered by Blogger.